Home / Posts tagged "Hoya de Cadenas Cava Brut"
Hoya de Cadenas Night Harvest, Hoya de Cadenas Cava Brut Rosé and El Miracle Cava Brut Rose awarded “Double Gold Medal” at Caesar’s Palace Hotel in Las Vegas. Bodegas Vicente Gandia adds new recognitions to its long list of international awards. 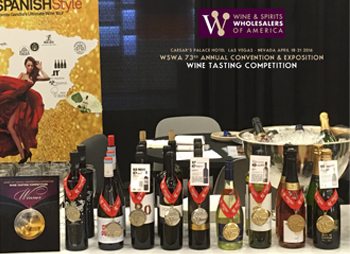 This time it has been in the “WINE TASTING AWARDS” organized by WSWA (Wine & Spirits Wholesalers of America) during the celebration of the “WSWA 73rd ANNUAL CONVENTION & EXPOSITION” at the Caesar’s Palace Hotel in Las Vegas. This event is considered the most important in the US and gathers leading professionals of the American wine industry. Thanks to these awards, the winery will have good volumes in the United States this year. Hoya de Cadenas Night Harvest, Hoya de Cadenas Cava Brut Rosé and El Miracle Cava Brut Rose have been the wines awarded with Double Gold Medal. Hoya de Cadenas Night Harvest, is a white wine with Appellation of Origin Valencia whose grape varietals are: Moscatel, Viura, Chardonnay and Verdejo. It has an attractive combination of gold and green tones; in the nose shows intense aromas of exotic fruits. In addition, it has a delicious softness that fills the mouth with notes of citrus and honeyed flavors of apple. Hoya de Cadenas Cava Brut, whose grape varieties are Macabeo and Chardonnay has a straw yellow color, fine and persistent bubbles. The aroma is clean and fruity, with a strong citrus character and with a background of floral notes. It offers a magnificent presence in the mouth thanks to the Chardonnay variety, dry and fruity at the same time. El Miracle Cava Rosado, born from the combination of the best Requena grapes, grown with northern exposures, patience and stillness of aging in the cellar. It is 100% Grenache, it has a red currant color, bright, fine, persistent bubbles and elegant reflections. The aromas display ripe red fruit with a background of pastry and mocha with subtle citrus notes. Creamy texture, wide and persistent in the mouth. In addition to this wonderful news, Nebla Verdejo Rueda was also awarded with Gold Medal.